This demo was released as a demo cassette and the bio speaks of 25 minutes of old death metal the ancient way. Bands like Unleashed, Bolt Thrower, Asphyx and Autopsy are named as references. Obviously the band name (Dismember anyone?) shows how deep their love for all things ancient death metal really runs. Be sure to surf to their website which is killer! It’s designed like one of those old fanzines. In an era before blastbeats started to rear their ugly heads death metal was all about evoking a certain atmosphere. 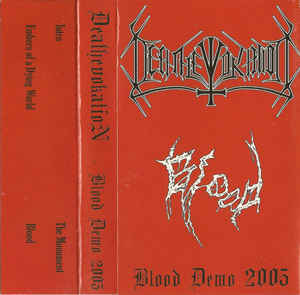 And it is with much pleasure that I can hear that Deathevokation have delivered some excellent stuff on their debut demo. The eerie intro sets the mood and when “Embers of a dying world” kicks in it’s one big fucken headbanging mania! Götz’ growls are deep but have this typical old school gritty phlegm. The guitars chug away with some delicious riffing and some occasional leads and solos. The song’s pace is quite slow, going to midpaced every now and then. The groove and drive scream old school. There is some resemblance in this tune to old Paradise Lost when Nick Holmes still growled. Ah good times. The “Embers outro” offers a damn fine acoustic intermezzo. This usage of some intros and outros reminds me of the old German band Torchure (anyone still remember them?). Not that strange since main man Götz Vogelsang originates from the very same country. “The monument” chugs out of your speaker and gets your head moving in no time, soon picking up the pace. The use of stops and go’s is put to much effect in this track. “Blood” is another fine example of how you can write a catchy song without breakdown beats, Iron Maiden riffs or clean singing.